10 years ago on March 2 2004, I left Santo Domingo where I had spent the previous night in a palatial hotel room, laying in bed watching the new comedy Two and a Half Men (the first episode I had ever watched), enjoying a meal of seafood linguine and berating myself for not ordering wine to go with the meal. The reason why the night of Monday March 1 2004 remains embedded in my memory is because of the stark contrast between it and the previous twelve days. Homeless children rest at the feet of one of many statues in Port-au-Prince’s historical central plaza in front of the Presidential palace on February 24, 2004. 2014 marked ten years since Haitian President Jean-Bertrand Aristide was overthrown in a coup. 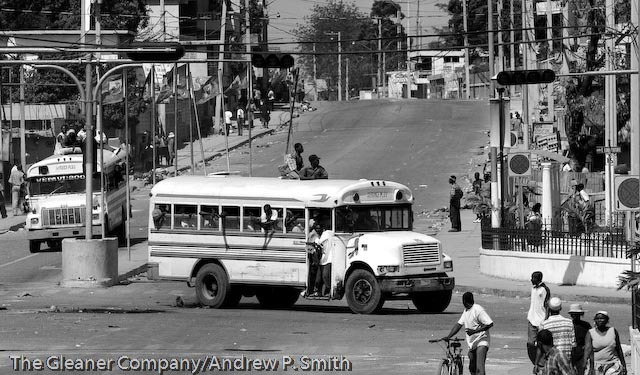 I was in Haiti in 2004 because my instincts told me that the combination of the bicentennial of the Haitian revolution and the civil unrest would result in a conflagration that would require in-depth coverage. My 2004 journal entry provides the setting: By the middle of the month a dozen towns were in the hands of armed rebels and the Presidency of Jean-Bertrand Aristide was threatened. This is in spite of President Aristide stating that he was the democratically elected president and that he was not leaving office until his term of office ends in 2006. This was the cauldron that I asked to be sent to in order to ascertain the state of affairs of our Caribbean neighbour. Eventually I left Jamaica on February 18 originally for 7 days which would also include carnival celebrations. As events turned out my stay was extended. From March 2003, the world’s attention was focused in the ongoing war in Iraq. However one year later it was said that there were more journalists in Haiti than in Iraq to cover the civil war and the possible ousting of President Aristide. My aim, however, was to find the social, environmental and political factors which led to the crisis and to record it by both words and photographs. (The images can be found here).Of course, I couldn’t ignore the current news, so I spent the first three days interviewing Micha Gaillard, Opposition Spokesman; Guyler C. Delver, President of Haiti’s Association of Journalists; Pierre Robert Auguste, President of the Artibonite Chamber of Commerce and human rights lawyer Joel A. Petit-Homme. On the Saturday I was part of the international media that attended President Aristide’s press conference at the Presidential Palace where he repeated his refusal to leave office. This freed me up on the Sunday to leave Port-au-Prince with my guide, translator, driver and all-around guardian angel, Sethia to visit the town of St. Marc. The drive on the way along the coast was extremely beautiful yet full of contrasts, with the azure Caribbean Sea juxtaposed against the brown, dry mountainous terrain. I thought to myself that maybe at another time I might be able to experience Haiti without the bloodshed. My journal entry describes how the day went: We made it to Saint-Marc where I photographed the results of the fighting between government and rebel forces. 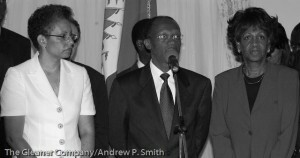 We found a cyber-centre, through which I was able to e-mail some of these photographs to The Gleaner. We were unable to interview many people due to the fear of some of the citizens to talk to the press in public. While in Saint-Marc, we heard that fighting was occurring in Gonaives, so I left it to my civilian guide to decide if we should continue or not. She decided against it, so we made our way back to Port-au-Prince that afternoon. On our way we heard that the second city, Cap–Hatien fell to the rebels. This left only one city left for the rebels to gain control of – the capital. 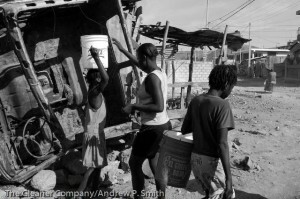 Residents of St. Marc collect water on February 22, 2004. 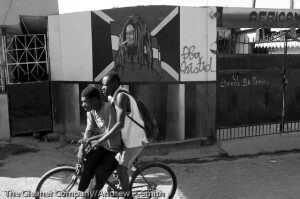 Residents of St. Marc cycle past painting of late Jamaican reggae superstar, Bob Marley on the streets on St. Marc on February 22, 2004. In the capital, we negotiated our way through several blockades manned by pro-Aristide supporters. These had been erected to prevent the arrival of rebel insurgents in the capital. So the rebels were closing in on the capital, but it was also carnival weekend. 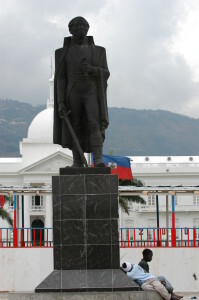 My belief was that the rebels would wait until celebrations were over before attempting to take Port-au-Prince. As it turned it, this was accurate and resulted in my departure date of Ash Wednesday being delayed. 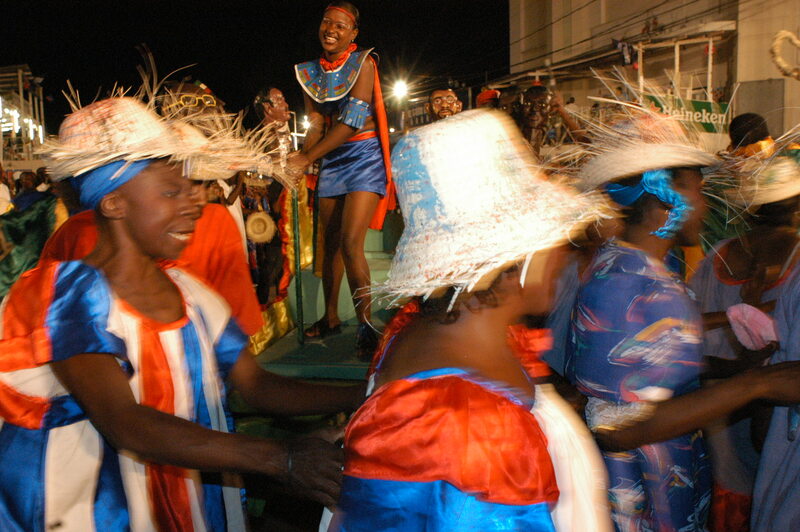 Haitians celebrate carnival on February 23, 2004 in Port-au-Prince as part of the 200th anniversary celebrations of the revolution which freed them from French rule. It was delayed because when Ash Wednesday came …..Miss Bazile …..was unable to pick me up because the streets were blocked with burning tyres and journalists were being attacked……but she said the next day – Thursday – we should be able to get to the airport…. 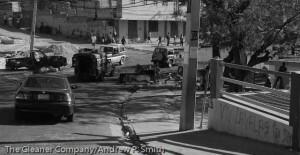 Debris and graffiti on the road to the airport in Port-au-Prince on March 26 2004. We made it to the airport Thursday morning, but I was unable to get on a flight out of the country…..On leaving the airport, we stopped at the Jamaican Consul that was locked. So I booked into Coconut Villa Hotel hoping to try the leave the next day, Friday. Next day, Sethia called to say that the airport was closed and that American Airlines had cancelled their flights at least until the following Wednesday. Therefore I booked into the hotel until then. I spent the next five days finding a balance of covering the news, being secure, remaining focused, dealing with the uncertainty of not knowing when I would leave and surviving on minimal amounts of food. Be in charge of your own resources – financial, communication, contacts, transportation and departure. The initial funds given by my employers was barely able to cover accommodation, and unable to cover the costs of a fixer/driver/interpreter. Fortunately, she was patient and allowed me to send her funds when I returned to Jamaica. Clarify what is expected of you from your editors. Initially I was told by one editor that I would provide stories when I returned, but while on the ground another editor requested stories that I had to furnish. Plan as much as possible before departure: Getting in touch with local fixers and contacts before arriving resulted in a trusted network that enabled me to get stories from a variety of sources. Be grateful for friends. My girlfriend at the time sent US$500.00 to me when the funds that should have been sent by my employers never materialised. This enable me to overnight in Santo Domingo when I missed my connecting flight to Miami on the Monday. Be grateful for family. My (late) aunt in Canada informed my father that the Canadian military was evacuating foreign residents which resulted in my departure from Haiti aboard a RCAF Hercules to Santo Domingo. 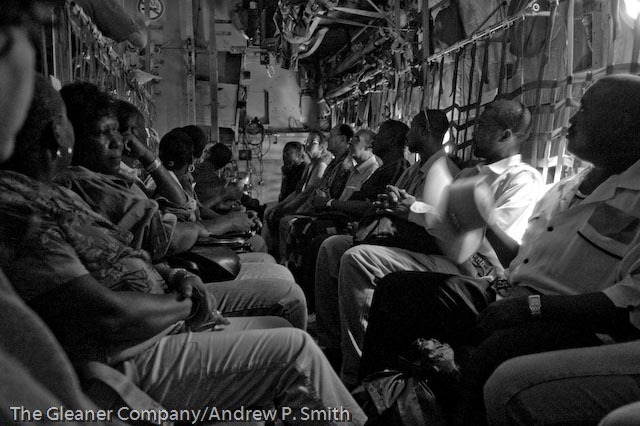 Aboard the Royal Canadian Air Force Hercules transportation plane that evacuated foreign nationals from Haiti on March 1 2004.